i've purchased too many things from the thrift store that i can't keep track anymore. 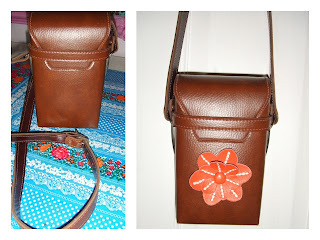 recently saw this little leather bag for $2.99 at my fave goodwill store. maybe it was a camera or binocular bag but i instantly fell in love with it! it reminds me of the cool bags at the Fossil store. not much change to it except that i added an orange leather flower.